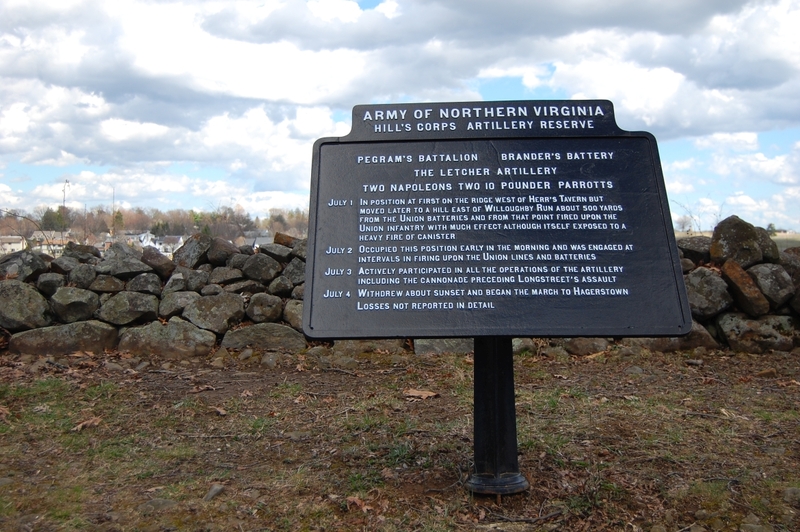 Over a dozen Confederate artillery plaques were returned to the field this past week after restoration work by Gettysburg National Military Park’s Cannon Shop. 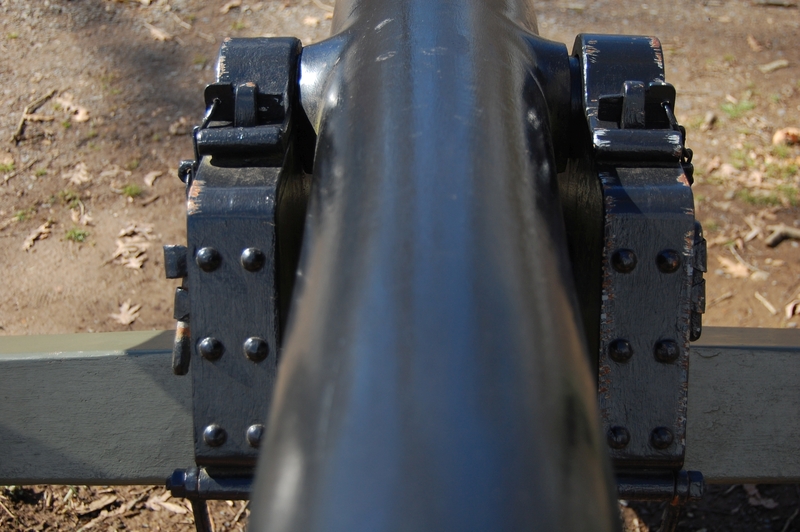 Started as a project in the late 1990s that was only supposed to take 10 years, the GNMP Cannon Shop has become nationally known in preservation circles for its restoration work on cannon carriages and tubes. 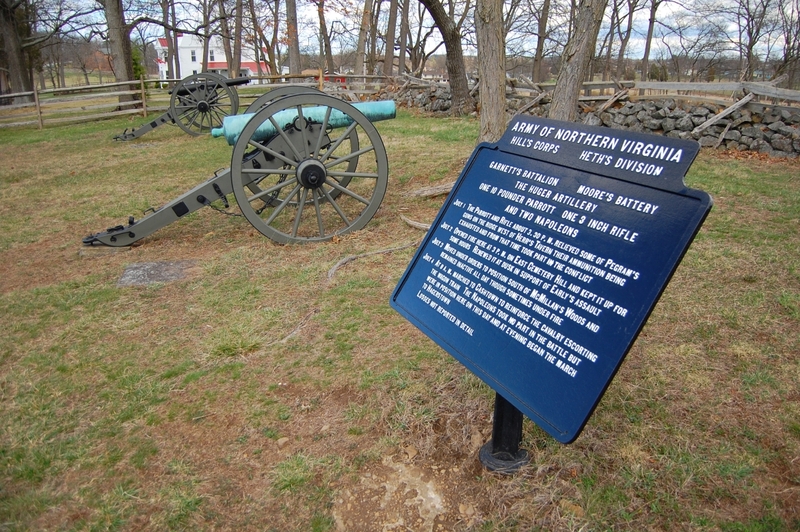 Besides being in charge of the gun carriages and tubes on the field, its employees and volunteers are also in charge of maintaining avenue signs, plaques, and markers.The National Guard Armory Building and David McMillan house can be seen along West Confederate Avenue in the left background. This view was taken facing north at approximately 3:00 PM on Monday, April 3, 2017. An artillery plaque in need of painting.McGraw’s Battery Plaque has cracked too many times over the years (you can see some of the seams from this cracking on the front), preventing it from being painted/restored with this current batch of plaques. This view was taken facing east at approximately 3:00 PM on Monday, April 3, 2017. 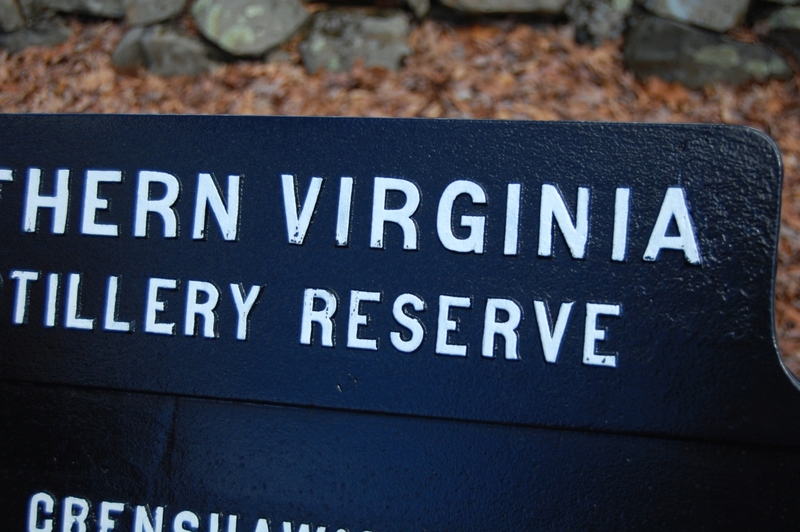 In previous years the plaques would be stripped, painted black, and then the letters would be painted white. 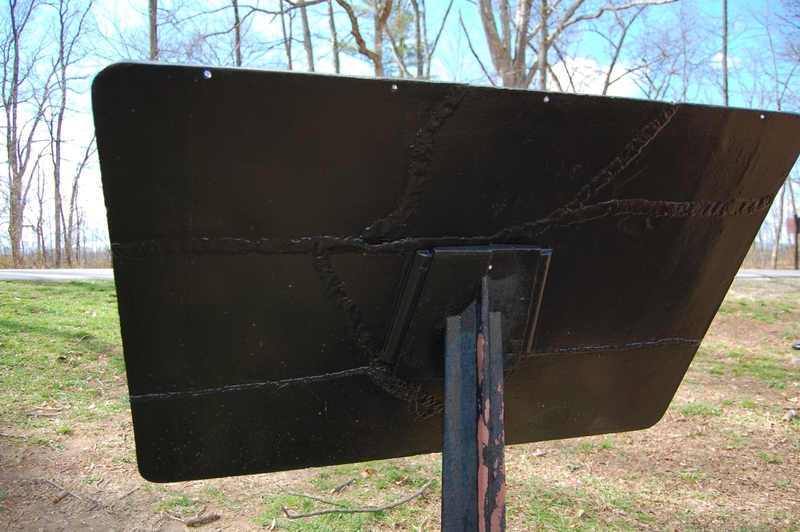 But recently, instead of hand-painting the black, the plaques are sent out to be powder-coated black. Powder coating is used “to create a hard finish that is tougher than conventional paint.” Hopefully this means the plaques won’t have to be painted/restored with as much frequency. The white lettering is still done by hand.This view was taken facing east at approximately 3:00 PM on Monday, April 3, 2017. 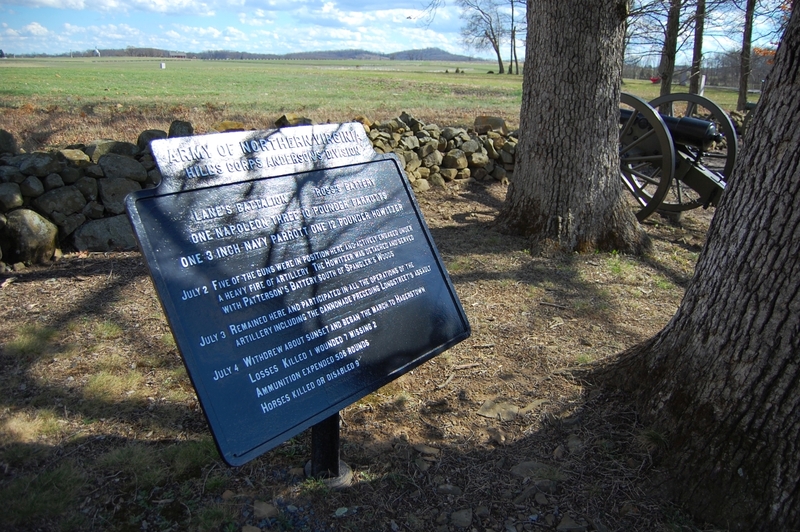 The easiest way to identify a plaque that’s been returned to the field this year is the shiny/reflective quality to the black surface.Little and Big Round Top are in the center background. This view was taken facing southeast at approximately 3:00 PM on Monday, April 3, 2017. Over time this shine will wear off. The community of Colt Park can be seen in the left background.This view was taken facing east at approximately 3:00 PM on Monday, April 3, 2017. 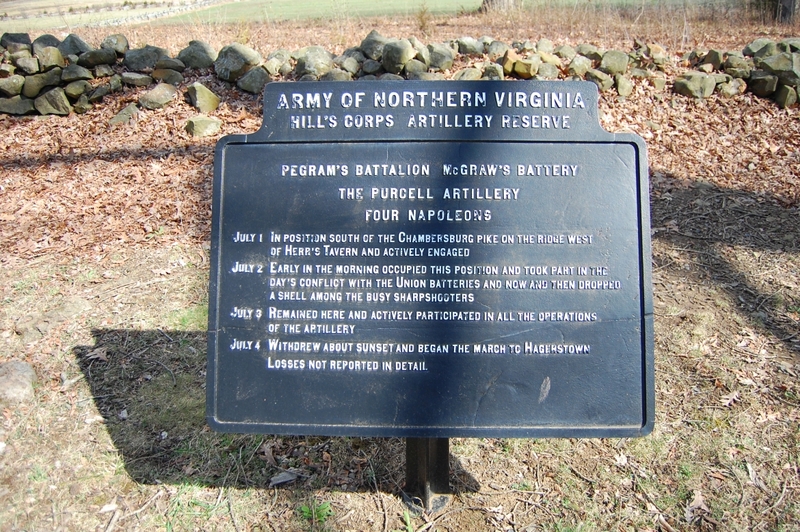 Some of these artillery plaques have been through a lot. The typical concern with these cast-iron plaques is cracking. When cracks develop, welding is necessary. 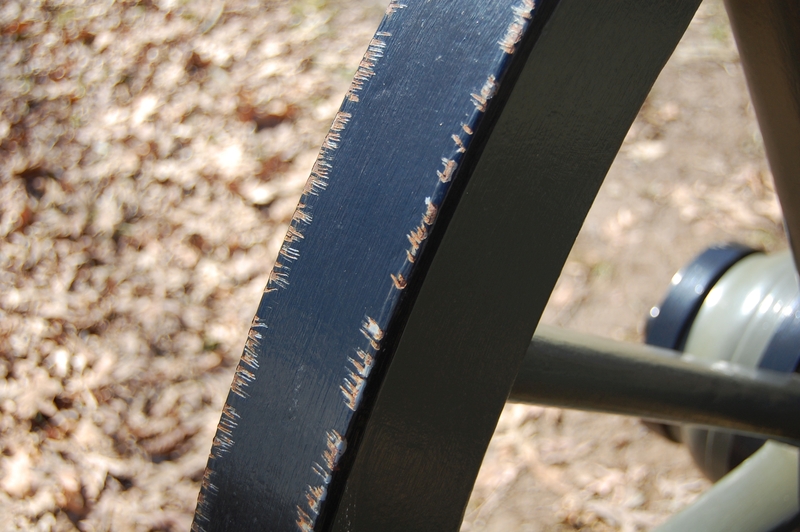 You can usually tell if welding has taken place by looking at the back.One plaque had to be recast a few years ago due to irreparable cracks in the iron. 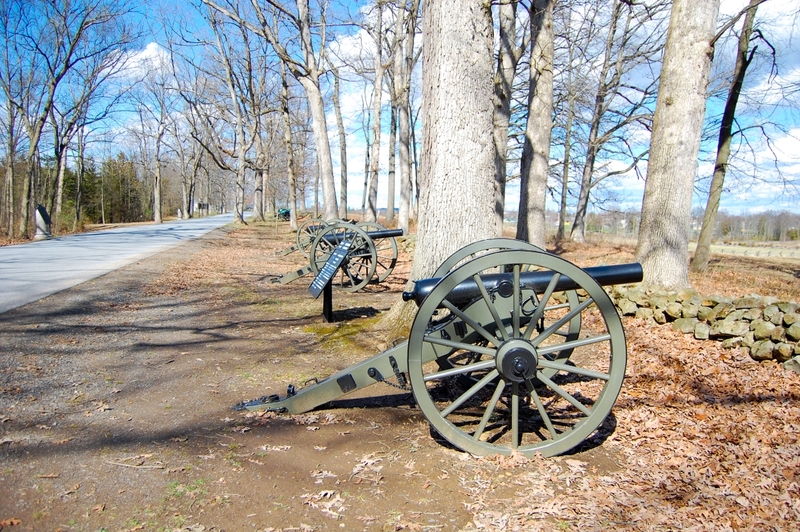 This is Brooke’s Battery, next to the Virginia State Memorial. This view was taken facing west at approximately 3:00 PM on Monday, April 3, 2017. 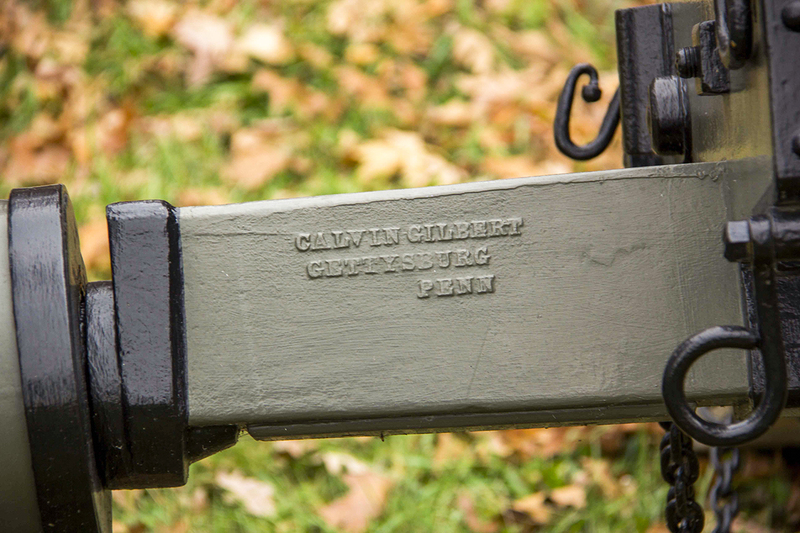 You can also see Calvin Gilbert’s Ironworks mark on the back of some of the artillery plaques. 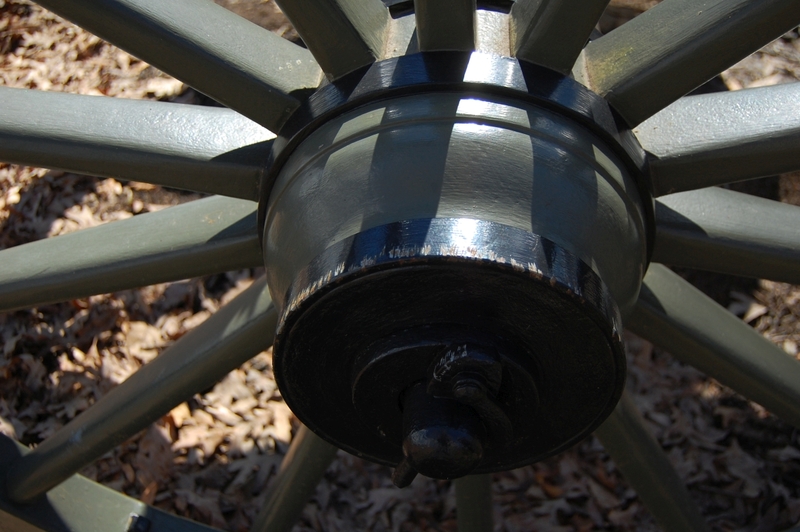 Gilbert’s Gettysburg foundry was responsible for creating most of the cast iron structures in the park designed by E.B. Cope.LBG George Newton’s artillery series has more. This view was taken facing west at approximately 3:00 PM on Monday, April 3, 2017. 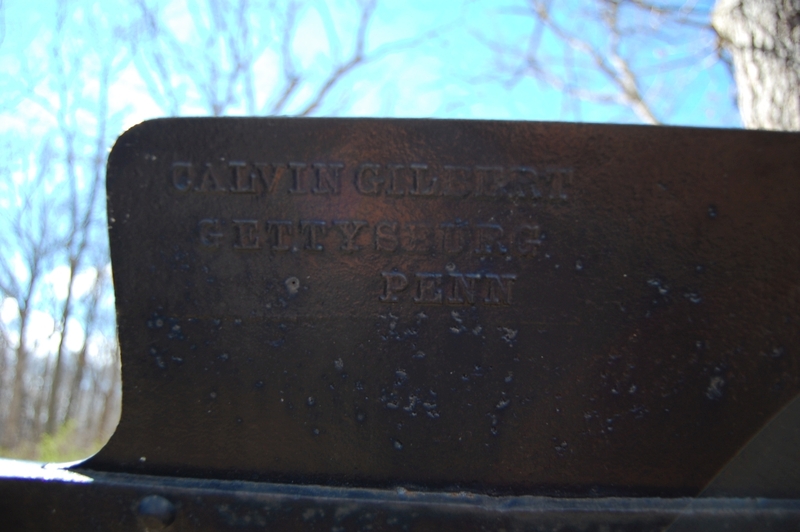 “Between 1895 and 1913, [Gilbert’s] foundry produced well over 250 carriages and 200+ iron tablets for battery positions, avenue signs, and farm signs as well as a variety of other markers.” His foundry also produced cannon carriages for display at Valley Forge.This image was taken on October 22, 2015 [NPS]. And after you’ve spent all that time restoring the carriage and painting it, you finally get to return it to the field…This view was taken facing north at approximately 3:00 PM on Monday, April 3, 2017. …Where squirrels promptly gnaw it to pieces.This view was taken facing east at approximately 3:00 PM on Monday, April 3, 2017. Yes, these marks are made by squirrel teeth.This view was taken facing east at approximately 3:00 PM on Monday, April 3, 2017. 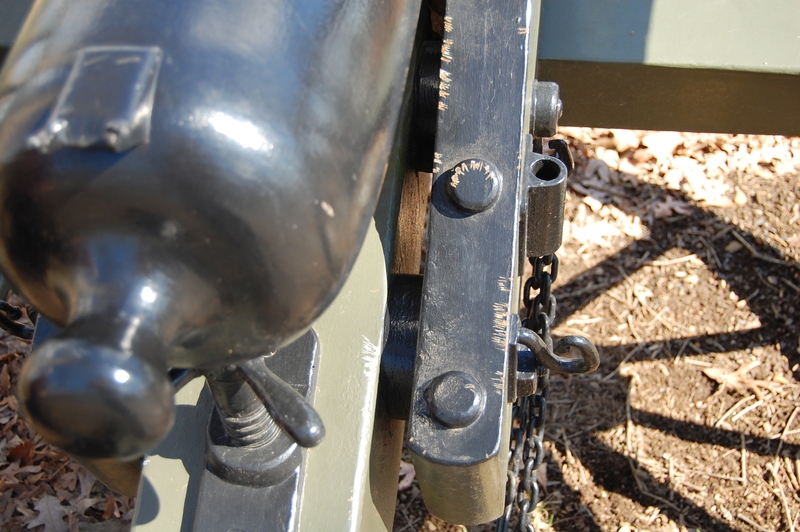 Cannon chewing squirrels. Squirrels have four incisors in the front of their mouths that grow throughout their lives. These teeth must be kept trimmed/filed, meaning squirrels like to chew on things…This view was taken facing east at approximately 3:00 PM on Monday, April 3, 2017. …including painstakingly restored cast-iron carriages.This view was taken facing west at approximately 3:00 PM on Monday, April 3, 2017.